No doubt that March 21, 2001 changed the course of history forever. It's the night that WCW, a wrestling company rich in history, was bought by its competitor, Vincent Kennedy McMahon. I had been in Dallas for the week and was away from the computer and had no idea this was going down. We arrived back home Monday afternoon and I logged in to the usual wrestling sites I frequented. They were all reporting that Vince had bought WCW. I couldn't believe it. I knew the company was likely going to be sold, but the last I'd heard Eric Bischoff and some investors were interested. I must admit I marked out a bit when Monday Nitro opened and fans were greeted by McMahon who made the announcement that he'd bought the company. It was one of the most surreal moments in wrestling history. What would this mean for the future of the business? Were the WCW guys and gals going to all go to the WWF? No one knew for sure. As both shows chugged along and WCW put on matches like Scott Steiner vs. Booker T for the heavyweight title and Ric Flair vs. Sting the anticipation grew. It all came to ahead when Shane McMahon showed up in Panama City Beach where Nitro was broadcasting from. 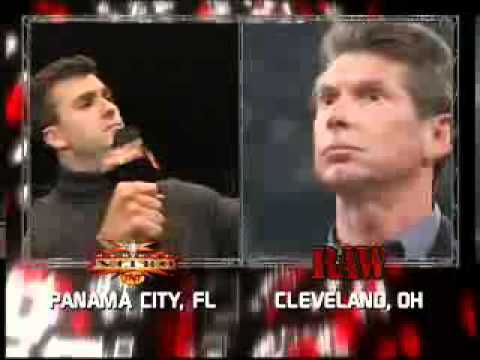 He and Vince sparred via satellite and Shane laid it out that WCW had been sold to a McMahon, but Not Vince. Shane had somehow bought the company out from under Vince's nose. This immediately took the focus off the pending WCW vs. WWF war in my opinion and became more about the McMahon family feud. Things escalated when ECW returned only under the ownership of Stephanie McMahon. So while the initial announcement and Vince appearing on Nitro was an awesome memory, the rest of the booking for the invasion angle feel flat. It had some moments as you can go back and read in some of the other Raw Memories blogs. Honorable Mention: I'm not sure how I let this one slip under my radar, but I did. I had forgotten about the Lightning Kid's match on Raw that made him a house hold name until Chad brought it up on a recent From the Rafters Radio show. Lightning Kid (aka Sean Waltman) had been a star in Global Wrestling Federation and was now wrestling in the WWF. Kid looked just like a kid. He was about 21 years old at the time and looked like he weighed about 160 pounds soaking wet. To say he was not the a typical WWF meat head wrestler would be the understatement of the year. Aces & Eights: Does No One in TNA Care? Raw Memories: #7 Vince Goes Boom!